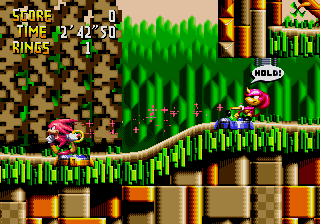 Knuckles' Chaotix is a platform game that's exclusive to the Sega 32X. There's five worlds (with five acts each) and your mission is to stop Dr. Robotnik from ruining the opening of Carnival Island's amusement park. The gameplay involves two characters being permanently connected which forces them to work together; you can either pick up your partner and throw them, or hold them in one position while you stretch out for a slingshot effect that zooms you both up ramps. The controls take a while to get used to but it's thrilling when you manage to string together a series of complicated moves to reach higher platforms! The level design has many clever moments, such as in Botanic Base where both characters need to stand on separate platforms to open locked doors. Other standout moments include Amazing Arena (locate and press a switch to return colour to the world) and Speed Slider (fast-paced action with lots of loops). Replayability is high too, as the five playable characters all have unique abilities. The platforming is a little uninspired, but the puzzle-like element of solving navigational problems to progress through levels is strong. Perhaps to cater for the unfamiliar controls, the game is extremely easy and the few enemies and bosses can be ploughed through with little effort. Worlds and acts are also randomly selected (meaning you're always flicking between locations), which ends up deflating the euphoria of progressing through an adventure in a set order. The Bonus Stage (hit power-ups while avoiding Exit blocks in a free-falling arena) and Special Stage (collect blue spheres in a 3D auto runner) are winners though and show off the 32X's scaling power. Knuckles' Chaotix is an innovative title and as long as you don't come into it expecting typical Sonic gameplay you'll find that there's a fun, yet unique platforming experience here. It's definitely not as accessible from a control standpoint, but those that give it a fair chance will discover a worthy spin-off with high amounts of replayability. Random trivia: The game was originally prototyped on the Sega Genesis and an early build of what was then known as Sonic Crackers is available online in ROM format.